The Global Volcanism Program has no activity reports for Southern EPR-Segment I. The Global Volcanism Program has no Weekly Reports available for Southern EPR-Segment I. The Global Volcanism Program has no Bulletin Reports available for Southern EPR-Segment I. The Global Volcanism Program has no synonyms or subfeatures listed for Southern EPR-Segment I. The narrow axial crest of Segment I of the Southern East Pacific Rise in some places is less than 50 m wide. An axial dome is located along the southern part of the segment. The largest lava flow field in this segment is the Animal Farm flow, named after a thriving low-temperature hydrothermal site discovered during a submersible expedition in 1993. The Animal Farm lava flow was dated by magnetic paleointensity measurements at about 1880-1950 CE, and older flows were dated by similar techniques to the 17th and 19th centuries. Carlut J, Kent D V, 2000. Paleointensity record in zero-age submarine basalt glasses: testing a new dating technique for recent MORBs. Earth Planet Sci Lett, 183: 389-401. Sinton J M, Smaglik S M, Mahoney J J, Macdonald K C, 1991. Magmatic processes at superfast spreading Mid-Ocean Ridges: glass compositional variations along the East Pacific Rise 13°-23° S. J. Geophys. Res, 96: 6133-6155. There is no Deformation History data available for Southern EPR-Segment I. There is no Emissions History data available for Southern EPR-Segment I. 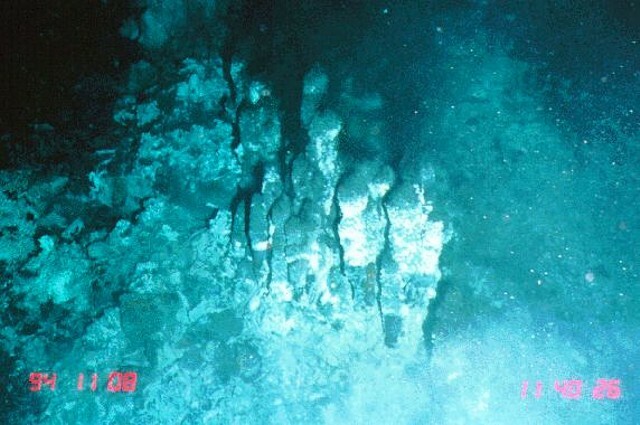 "Black smoker" vents (low chlorinity fluids, 374 deg C) were photographed at the "RM28" site at 18 deg 26 min S on Segment I of the Southern East Pacific Rise in November 1994 from the Japanese submersible Shinkai 6500. The narrow axial crest of Segment I of the Southern East Pacific Rise in some places is less than 50 m wide. The largest lava flow field in this EPR segment is the Animal Farm flow, named after a thriving low-temperature hydrothermal site discovered during a submersible expedition in 1993. Image courtesy of NOAA Vents Program, 1994 (www.pmel.noaa.gov/vents/chemistry/images/). The Global Volcanism Program has no maps available for Southern EPR-Segment I. There are no samples for Southern EPR-Segment I in the Smithsonian's NMNH Department of Mineral Sciences Rock and Ore collection. Large Eruptions of Southern EPR-Segment I Information about large Quaternary eruptions (VEI >= 4) is cataloged in the Large Magnitude Explosive Volcanic Eruptions (LaMEVE) database of the Volcano Global Risk Identification and Analysis Project (VOGRIPA).